A Regina man is sharing his drone's eye view of spring melting around the city. He normally snaps photos of sunsets, northern lights and landscapes. 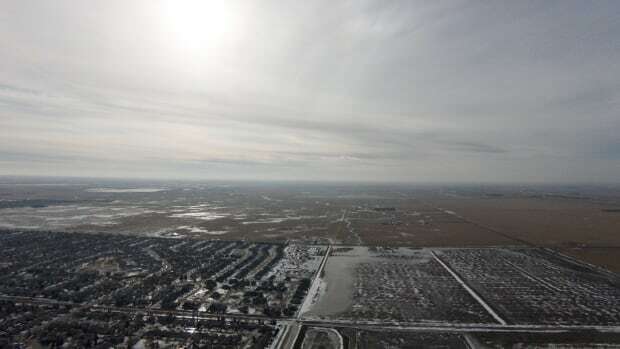 But when he took his aerial drone out for a spin this weekend he got an elevated look at melting snow around Regina's northwest. 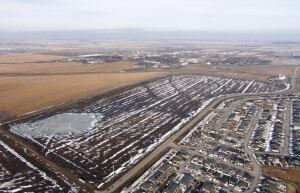 ​He spotted some wet fields where the Skyview subdivision is being built. "It's interesting to see how all the melt is going, and I kind of noticed how it was all pooling in one area, and it seems to have been fed by-- it looks like a little creek that's zig-zagging from the west," he said. Despite living nearby, he's not concerned about the excess water. The view from his aerial drone to capture this photo of wet fields in Regina's northwest. He says this photo is facing northwest from Fafard Park. I didn't think it was that bad, I mean, what happens if a blocked culvert that's full of ice just all of a sudden lets loose? Maybe all that water will drain somewhere. From Bourassa's vantage point in the air, he had a clear view of the water. The Water Security Agency says some parts of the province are seeing above normal spring runoff, but Regina hasn't seen much excess water so far.